Welcome to CME on ReachMD. This segment, “Tissue Morcellation: Managing Risks to Drive Best Patient Outcomes,” is provided by Omnia Education. Prior to beginning the activity, please be sure to review the faculty and commercial support disclosure statements, as well as the learning objectives. This activity will discuss basic principles for safe and effective use of tissue morcellation during hysteroscopic and abdominal procedures. We will focus on guidelines, evolutions in the procedure, and study of the risks versus benefits for adoption of this technique. Dr. Kirsten Sasaki, welcome to the program. So, can you start out by telling us in which cases you use hysteroscopic versus laparoscopy or an abdominal morcellation? Definitely. So, hysteroscopic morcellators are often used for the removal of submucus fibroids or endometrial polyp, versus laparoscopic or abdominal morcellation may be required for the removal of fibroids that are intramural or subserosal. 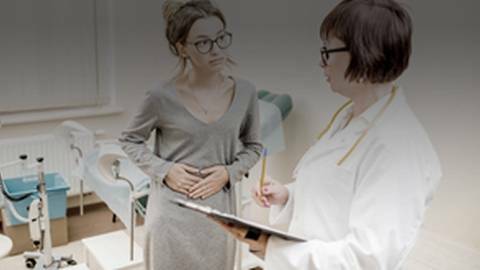 The way that hysteroscopic morcellators work is you place an instrument into the vaginal and then into the cervix in the uterine cavity and it enables the surgeon to perform a minimally invasive procedure. Given this, though, not all submucus fibroids can be removed hysteroscopically, and this often depends on the size, the number of fibroids, and the location of the fibroids, especially in the relation to the serosa, so there are some fibroids that are adjacent to both the endometrium and the serosa, and those fibroids present an increased risk of perforation if it were performed hysteroscopically. So those are often best performed laparoscopically or with abdominal morcellation, and the way that my practice determines the best route of the procedure is during the preoperative workup. We perform a saline-infused sonohysterogram, and it basically identifies where within the cavity and within the myometrium the fibroid lays. And then, for laparoscopic or abdominal morcellation, after the fibroids are removed laparoscopically or robotically, if they are larger, then the large incision made, usually about 10 to 15 mm, then morcellation is a process that can help remove the fibroids through a smaller incision. Okay, great. And can you tell us a little bit about the different types of hysteroscopic morcellators, and also how you counsel your patients about the risks and benefits of them? Yes. The first case report of using a hysteroscopic morcellator was actually in 1976, and Dr. Neuwirth actually modified a urologic resectoscope to remove some submucus fibroids. So, currently, on the market there are 3 different types of morcellators. There is the MyoSure, which is made by Hologic, Truclear, which is made by Medtronic, and the Symphion morcellator, which is made by Boston Scientific. The morcellators are different in the type of energy that they use. So, the Truclear and the MyoSure use mechanical energy, so there is actually a blade that cuts the tissue up, versus the Symphion uses bipolar energy. They both cut the tissue up and aspirate the tissue, and they suction the pieces of the removed tissue into a trap, and so it overcomes some of the limitations of visualization that may occur with other forms of hysteroscopy. Some of the benefits to the patients are that fibroids can be removed without the need for any incisions, so patients are often back to their normal activity within 1 to 2 days, there is often less pain and less operative time than using an operative or hysteroscopic resectoscope. Most of the risks are similar to risks one may encounter if you’re just doing a diagnostic hysteroscopy where you’re just looking in the uterine cavity, and a MAUDE database evaluation found that the most common complications were minor complications, uterine perforation being the most common, followed by fluid overload, postoperative bleeding, and pelvic infections, and then very rare, major complications included ICU admissions, bowel injuries, hysterectomies and even a case of death. Okay, thanks. And, can you talk a little bit about the different types of laparoscopic power morcellators, and also how you counsel your patients about the risks and benefits of those? So, similar to hysteroscopic morcellators, there is 2 types of energy used in the current market of laparoscopic morcellators. So, the most common is the mechanical morcellator which, again, uses the blade to cut up the tissue. So currently on the market there is about 4 different laparoscopic morcellators: there is the RotoCut made by Karl Storz, the Morce Power Plus made by Wolf, the MOREsolution made by Blue Endo, and Xcise made by LiNA. And then there is one bipolar morcellator that’s made by Olympus, called the PKS PlasmaSORD. So, the benefits of laparoscopic power morcellation really go along with the benefits of being able to perform a minimally invasive procedure, especially a myomectomy or hysterectomy, and compared to an open procedure, we know that there is improved operative and perioperative outcomes for the patient so there is less pain, a shorter hospital stay, a more rapid return to normal activities, decreased risk of a wound infection, decreased risk of a hernia, and a venous thromboembolism. But again, there are risks involved. So, specific just to the morcellators, Dr. Milad did a study in 2014 where he looked through the MAUDE database, and over a 15-year period, found 55 reported short-term complications, and these, again, are physician reported and these are voluntary by physicians. There are some mandatory reporters, including the device manufacturer, but based on physician’s elective or a voluntary process. So, the most common were bowel injuries, and then followed by vascular and genitourinary injuries, so injuries to the kidney, the ureter or the bladder. And in 55 of these complications they found that there were some contributing factors, with the most common being lack of surgeon experience and control of the device, as well as lack of adequate visualization. So those were the main short-term complications. Long-term complications with laparoscopic or abdominal morcellation are really 3 main ones. So, the most common is something called a parasitic myoma. So basically, little pieces of the tissue are fragmented off, and they remain in the abdomen or pelvis and they find a blood supply and they grow, and the incidence of this is really unknown; it’s mostly based on case reports, but generally is less than 1% of cases. And then there is the risk of something called a disseminated peritoneal leiomyomatosis, which are a hormonally dependent condition in which little nodules stud the pelvis, and they can present very similar to ovarian or peritoneal carcinoma. And then the final concern is dissemination of malignant tissue, which is the main concern for most patients. So what, then, are the alternatives to laparoscopic power morcellation? So, if you wanted to continue and to do a minimally invasive procedure, it would be a mini-laparotomy, so making a small incision either at the umbilicus or at the bikini line and either placing the specimen in a bag and cutting it up with a scalpel or placing it in the bag and removing it intact. Alternative options include a colpotomy, so making an incision vaginally and performing hand morcellations can be done, even if a total hysterectomy is not performed. And then the last option is contained power morcellation. In 2014, the Food and Drug Administration, or the FDA, issued a recommendation discouraging the use of laparoscopic power morcellation of uterine fibroids. Does this include the use of hysteroscopic morcellators, and why not? This recommendation does not include the use of hysteroscopic morcellators. The main concern by the FDA was the upstaging of undiagnosed or unsuspected malignancies with power morcellation, specifically, of a malignancy known as leiomyosarcoma. It’s the most malignant nonepithelial tumor of the uterus, so it accounts for about 1-2% of all uterine malignancies, and the concern with this type of malignancy is that even with the correct staging, the outcome is very poor. So it generally has a 5-year survival rate between 18 and 65%. With metastatic disease, the median overall survival is only 1 to 2 years, and even after an abdominal hysterectomy, the recurrence rate is about 50%. So, the difficult thing with sarcomas and leiomyosarcomas are they are very hard to diagnose before surgery. They require a histologic diagnosis that you often only get after the specimen has been removed, and so the FDA’s concern is because it’s so hard to diagnose, there are cases of, unfortunately, patients inadvertently having sarcomas morcellated, and their outcome potentially being worsened by this. So, the FDA has quoted a risk of about 1 in 350 procedures that are performed for presumed fibroids are actually on sarcomas, and about 1 in 456 are actually performed on leiomyosarcomas. So, other authors have actually reanalyzed a lot of the data and included more studies and found different rates of this, including a rate of 1 in 2000 procedures by Pritz versus about 27 in 10,000 by Wright. So, based on the data of morcellating leiomyosarcomas, there is some evidence that it may decrease median recurrence-free survival, and also increase the risk of recurrence. So, all of this information is based on a small number of studies that have relatively small sample sizes and that are all retrospective, and it’s important to note that they don’t only use power morcellation in some of these studies but also hand morcellation. So, the largest study was published in 2014 by George, and he compared 39 cases of abdominal hysterectomies that were not morcellated, versus 19 cases of hysterectomies that underwent morcellation, and he found that for those that were morcellated, there was a 3 times increased risk of recurrence and a shorter median recurrence-free survival. So in 10 months a median-free survival with morcellation, versus 39 months without morcellation. So, when evaluating the data on hysteroscopy, there are just some general differences with the procedure. So, when hysteroscopic morcellation is performed, you’re actually sucking up all of the pieces that are removed into a trap, but there is the potential, because you’ve used pressure to distend the uterus, that small cells may efflux out of the fallopian tubes. So, the question is whether this occurs with hysteroscopic morcellation, one, and whether this is going to worsen survival and prognosis in patients who have an undiagnosed malignancy? Most studies that evaluated the risk of seeding cancer cells is based on diagnostic hysteroscopy, and most of them are done on patients with endometrioid adenocarcinoma of the uterus, because that’s the most common type of uterine malignancy. But based on a meta-analysis of 19 studies by Chang where they were identifying patients who had undergone hysteroscopy prior to a hysterectomy for endometrial carcinoma, they found that although the hysteroscopy did increase the finding of positive washings in patients with later-stage disease such as Stage III or IV, there was no effect on prognosis, including recurrence or disease-free survival. As I mentioned, there are no specific studies on the risk of leiomyosarcoma; most of the data is based on case reports. So, in 2008, Nappi performed a case report of a hysteroscopic resection of what was later determined to be a leiomyosarcoma, and at the time of abdominal hysterectomy the cytology was negative and there was no evidence of metastasis noted. And then, in 2009, another case series of 7 patients with non-endometrioid malignancies—so they were not all leiomyosarcomas—that were initially resected hysteroscopically, upon staging there was found to be no long-term adverse effects on the prognosis and the survival. Certainly, due to the concern about spread of malignancy, and also in response to the FDA-issued recommendations, some new methods of contained laparoscopic power morcellation have emerged. This includes the first FDA-approved tissue morcellation containment system, PneumoLiner. How does this change the process and the potential risks of laparoscopic power morcellation? So, the PneumoLiner was approved by the FDA in April of 2016, which was almost exactly 2 years after the initial recommendation against a laparoscopic power morcellation. I believe that it is a move in the right direction, as studies have found that a complete abolishment of morcellation may lead to more associated deaths from hysterectomy if they are all performed abdominally in the indication for fibroids, and this is found under a decision tree analysis by Dr. Matthew Siedhoff et al in 2015. So, the method of contained power morcellation places the specimen to be morcellated in a bag. The bag is insufflated with pneumoperitoneum and with the laparoscope inside the bag with the morcellator, the specimen is morcellated. It seems to eliminate the risk of parasitic tissue and leiomyomatosis, but the FDA warns currently that it’s not been proven to reduce the spread of potentially cancerous cells during power morcellation, although the bag has been tested and found to be impermeable to substances similar in molecular size to tissue cells and body fluids. Well, I’d like to thank Dr. Kirsten Sasaki for talking with us today regarding the various tissue morcellation procedures, the related risks versus benefits to patients, and lastly, where and how morcellation methods are evolving for the future. Thank you so much. This segment of CME on ReachMD is brought to you by Omnia Education. To receive your free CME credit, or to download this segment, go to ReachMD.com/CME on your smartphone or tablet device. Thank you for listening. Have you adopted tissue morcellation into your practice? Here’s how to manage the risks so you can achieve better patient outcomes. To help you ensure the safe and effective use of tissue morcellation during hysteroscopic and abdominal procedures, this activity will focus on the guidelines, evolutions in the procedure, and the risks versus benefits of adopting this technique.